This Site was first set up in January 2001, last revised 04 March 2010. You will then need to 'run' AC.EXE and allow it to expand all 75 files into a single directory of your choice. Next, simply open the file INDEX.HTM with your browser off-line. You should be able to see both English (Arial) and Greek (Symbol) fonts displayed in the text - with Hebrew inserts as .GIF images. Please note: Strict implementation of HTML prohibits the display of 8-bit Greek characters from the 'Symbol' font, as still used on this site to display unaccented Greek characters. Users of Internet Explorer should expect no problems but users of Firefox 3.x may need to install the 'Web Page Fixer +' add-on available here or here before the Greek text will display as intended. published by Capabel Press in September 2009.
at the time they were first composed. which must have been familiar to the Gnostic authors. and now explained in this groundbreaking book. It has been my purpose to research the scriptural basis for the doctrine and liturgy of the Christian church. In this website I present some of my findings to date (September 2006). The title aims to reflect my chosen method - to read the 'New Testament' in the language in which it was written and so to enter the ideological world of the authors of Judaeo-Christian scripture. So far as may be possible, I have sought to understand these texts as the writers did themselves. This can be the basis for an 'Authentic Christianity'. In September 2000 I set out to study the 'New Testament' in Greek. I was soon surprised to find that there was more to it than I had expected. These texts cannot be records of history. They are filled with allegorical references to the stories of the book of 'Genesis' - and with riddles of diverse kinds. The riddles of scripture take many forms - from allegory and arithmetic translation to the extensive use of anagram techniques. The use of anagrams is established in the religious traditions of Egypt - and prevails in Hebrew scripture. From the Ptolemaic era (323 - 30 BCE) similar methods are adopted for the composition of Greek scripture. I give some examples from the Septuagint version of Isaiah - and from the book of Revelation. The use of anagrams provides for a 'hidden component' to be concealed within the texts of the 'New Testament'. Translation to another language deletes this component. As a result, no translation from the Greek conveys the complete message - and anyone relying only upon translation(s) will certainly be led astray. It seems likely that those formulating doctrine and liturgy for the Latin church have been unaware of this - and remain so to this day (which may explain many things). 'A man is sowing seed'. In the gospels there are several variants of this story. The longest one is at Mt.13. But is there more to these stories than most people realise? For a start they may refer in allegory to Noah [Gn.9:20]. Then at Mt.13:39 we are told that 'the enemy, the one sowing them, is the devil'. Next we find that the 'number value' of 'the one sowing' is 666 - disclosed in the book of 'Revelation' [Rv.13:18] as 'the number of the beast' - which is also 'the number of a person'. And we shortly realise that the 'number value' of the name 'IHSOUS' (Jesus) is 888. So what is going on here? Then the 'seeds which have been scattered' may stand for the letters of the alphabet : 'scattering letters' within the text would allow the author to conceal a second message within the literal text we are reading. This is what we know as encryption. But is there a concealed component to the message of the gospels? If so, what form does it take - and what could be the motive for composing scripture like this? The origins of all this appear to lie within the religious traditions of Egypt and Mesopotamia. But he said to them "How many breads do you have? Go and see." And, knowing, they said "Five - and two fish." [Mk.6:38]. Where did they go to look? What were they looking for? Why was it five? And how did those fish get in on the act? No one ever asked about them. Here the 'Bread & Fish' stories of the Christian gospels are subjected to a careful analysis. The observations made rely upon the minutiae of the Greek text. A link is established between these stories and the story of the creation sequence set out in the Septuagint [LXX] Greek version of the book of 'Genesis'. Evidence is presented to show that both numerical and circumstantial details of the 'feeding' stories in the gospels refer to the LXX texts relating Day 3 and Day 6 of the Elohistic creation sequence. In each case it is 'towards evening' and there is '(green) grass' found in what began (on Day 3) by becoming 'a dry/desert place'. Then there is 'food' on hand. But this food is 'food for the mind' - and it is found within the text itself. By solving the puzzles simultaneously we can identify what is meant by 'bread' and by 'fish'. They are components within the text itself. We find that there are 6,974 pieces of 'bread' in the 'canon' of the 'New Testament' - and 177 'fish' of the kind defined in the three synoptic gospels. The riddle (repeated three times in the gospels) about the 'salt losing its saltiness and becoming bready' appears to confirm the otherwise surprising result from this analysis. This short story was written during Lent 2002. The tower at Oldstead really does exist [Map ref: SE 538 804]. But many details in the story are fictional because (as with the gospels) it suited the purpose of the writer to adapt reality, making the story resemble a dream and leaving it pregnant with subliminal meaning. Perhaps it will help to prepare you for what we may find in exploring further the concealed components of the gospel message. In Chapters 2 and 3 I have tried to explain some of ways in which scripture contains a 'concealed' component - and how one may know it. But why should this have been done? Many are puzzled over this point. If this is 'the word of God', why doesn't God make it easy for us to receive the complete message? I refer to Augustine bishop of Hippo, to the curses in 'Genesis', and to the 'Call of Isaiah' at Is.6. In Chapter 3 I wrote on the identity of the 'bread' and the 'fish' - analysing the gospel stories of the 'Feeding of the 5000/4000'. Here I consider the intrinsic significance of these entitites - which can be found dispersed throughout the texts of Greek scripture. In the four gospels the title 'son of man' is used 78 times. Here I consider who this may be. Melchizedek, priest and king, is mentioned only twice in the entire 'Old Testament' - but within the 'New Testament' eight times, all of them in the 'Letter to the Hebrews'. There the author declares that the priesthood of Jesus Christ derives from 'the order of Melchizedek'. It is therefore of interest to explore the identity of this mysterious figure who follows the way of Cain by "bringing out bread and wine" - for clearly it bears upon the identity of Jesus Christ. The title 'Melchizedek' appears to be an alias for one already introduced as 'king of Sodom'. Then in the gospels this is the witness of John : "I am not competent ... to untie the strap of his sandals". This suggests a reluctance by John to develop any relationship with Jesus. The word 'proswpolhmyia' (face value) does not appear in the Septuagint version of the 'Old Testament'. But in the texts of the Greek 'New Testament' [GNT] it appears (with variations) seven times. Here I probe its significance. This is what we find at Jm.2:1 : "My brothers, do not hold at face value belief in our lord Jesus Christ of glory". It would appear that the doctrine of the Christian church has been formulated for most of its history by those who never understood the scriptures. I examine the sometimes confusing relationship between language, the 'logos', the tongue, and the 'word of God'. For 'the tongue ... is a restless evil, full of death-dealing poison' [Jm.3:8]. Indeed it does appear to be the tongue of a serpent 'using deceit', for 'their throat is an open tomb' and 'the poison of asps is under their lips' [Rm.3:13]. These statements are thick with allegorical and anagrammatic significance in the Greek text. An asp is a venomous species of viper found in Egypt - whilst in 'Genesis' the serpent is most distinctly a token of evil (as confirmed at Rv.12:9; 20:2). Then in the 'New Testament' there are four references to 'gala' (milk) - as well as to Galatians and Galileans. So what of the 'Logos' - so commonly mis-translated to be 'the Word' of God ? Evidently the witness of John the Baptist is of key importance. It appears in all four gospels - and arguably in the book of 'Revelation' [see Rv.1:9]. Here I show how to extract the 'key' to scripture from the book of Genesis - and then probe the significance of John's evidence, from 'He was My First' to 'The Strap of his Sandal' and from 'A Pigeon from Heaven' to 'The Lamb of God'. This short story was written in November 2002. In the tradition of the authors of scripture, a reader is 'put to the test' with a meal. But I fancy that (in our age) this is not much understood. Here I point up the deeper significance of a story which appears only in the Fourth Gospel (that attributed to John). It is the well known story of the dinner at which Jesus washes the feet of his disciples. With this story the author invokes the curse first established at Gn.3:15 - so proceeding to frame Jesus as 'seed of the serpent' against whom Peter is expected to 'raise his heel'. But in the narrative Peter himself is portrayed as failing to recognise Jesus. Thus he permits Jesus to wash his feet - and over the centuries I fancy that many readers will have emulated his miscalculation. But a diligent reader, familiar also with the early chapters of 'Genesis', will be sure to learn from this clever story the real identity of the 'Christ' figure. Thus the 'spell' is broken - here without reliance upon anagram techniques. In the gospel attributed to Matthew Jesus issues Peter with what seem to be the instructions for a 'treasure hunt'. He says "Go to the sea, throw a (fish)hook, and take up the first fish coming up. And opening its mouth, you will find a standard". In attempting to solve this riddle about a coin in the mouth of a fish, we find ourselves re-evaluating the 'Sermon on the Mount'. The book of Isaiah warns explicitly of a 'Stone for Stumbling', a 'Rock for Falling'. Over this obscure object both the Jewish and Christian traditions have stumbled for several millennia. At Gn.4:5, the first-born Cain falls to his face. It is this 'stone' which has caused him to trip - though he is the last one to know it. In all the time since this story was written many readers have stumbled alike. But those who read and understand this chapter will stumble no more. Scripture is configured to be a 'mystery'. No one should underestimate the consequences which this has for the reader. Today the tradition of the Christian church is altogether false (as it has been since its inception). The reason is simple : instead of explaining this ancient mystery, the approved teachers of the church have failed those they seek to lead - for they, the teachers, have been caught out by it themselves. But a diligent reader of the gospels, familiar also with the early chapters of 'Genesis', may still penetrate the mystery. Then he/she will be sure to learn the real identity of the 'Father' figure, the one sending Jesus into the world. It is none other than Satan, the devil, the ancient 'serpent', so-called 'deceiver of the whole world' [Rv.12:9]. This conclusion is fully consistent with the conclusion of Chapter 13 - that the author of the fourth gospel writes to define Jesus as the 'seed of the serpent'. And since this 'serpent' is nothing more than a figment of the literary imagination, first established in times of antiquity, it must follow that the doctrinal and liturgical tradition developed by the Christian church is altogether void. Then we may infer that the Christian church was established by persons seeking authority but who never fathomed the 'mystery' of scripture. To this day it is surely sustained by persons equally misguided. Then this explains a great many things besides. There is a rough parallel between the story of Abram's encounter with Melchizedek, King of Sodom [Gn.14:17] and Saul's encounter with Jesus [Ac.9:3]. Both take place near Damascus. Here I analyse the three reports of the 'conversion' of Paul - and the vision received by Peter on the rooftop at Joppa. Saul's is a vision of Jesus - identified also as the satanic figure Cain from 'Genesis' Chapter 4. Cain's voice is heard, Cain's name is perceived. Peter's is a vision of Paul - now revealed as a 'Trojan horse', a mere 'container', outwardly attractive but inwardly "filled with unclean things".
" ... open their eyes for turning back from Darkness to light and (away) from the authority of Satan over God - for taking them remission of sins and a 'destiny' among those made holy by a faith which is in ME"
This statement is worth reading with care. All scripture treats with this troublesome "authority of Satan over God". The scriptural authors hold that it is the Light which truly is evil - and the Darkness good. But they do not hinder excessively what they hold to be the wish of Satan - which is to turn your eyes away from this fact and to trick you into thinking that he, the Light, is really God. Thus is every reader of scripture 'put to the test'. So be warned - and take care how you go. ! In the fourth chapter of 'Genesis' we find the brothers Cain and Abel bringing their ritual offerings. Evidently the gifts brought by Abel are acceptable to God. But to Cain and to his 'sacrifices' God pays no attention. Cain is unable to understand the reason for this ... and all hell is let loose when next he slaughters his brother Abel. Here I analyse the Greek text of LXX Genesis in the light of other information given in scripture - thus resolving the ancient riddle. It swiftly becomes apparent that every reader of scripture must solve this riddle correctly - or be led badly astray. 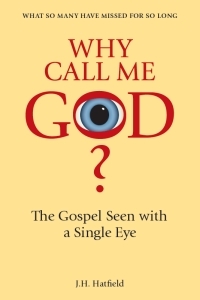 For until the reader can distinguish the 'lord god' from God himself, it is almost certain he will misinterpret the message of scripture in its entirety. For, like Cain in the narrative, this reader will have failed to distinguish Light from Darkness, good from evil, and Satan from God. No mistake could be more serious than this. Yet amazingly it turns out that this has been the mistake made by the entire Christian church ever since the time of its establishment in the 4th century CE. Beyond all doubt this (by now fragmented) 'church' is an organisation utterly deceived. For now it is abundantly clear that those responsible for its establishment fell directly into the logical, interpretational, and spiritual 'trap' set for them so long before by the wily and resourceful authors of scripture. They were tricked into conflating Satan with God. The trap is the very same into which (as we shall see) Cain himself falls in the actual narrative of 'Genesis'. It becomes clear too that the principal sacramental rite of the Catholic church, the offering of Bread and Wine in the 'Eucharist', is merely the sacrifice of evil Cain - repeated.